We support your global business communications through website production, translation, interpreting, and temporary employment. Cross-country skiing is a very popular sport in its homeland, Europe. Like ekiden (relay road race) or marathon in Japan, all of the World Cup games are broadcast live during the winter season. Europeans are passionate about cross-country skiing events, be they short, medium, long distance or relay races. This is particularly true in Holmenkollen –a neighborhood in Oslo, Norway– where more than 100,000 fans rush to the woods to cheer for the skiers from the sidelines. 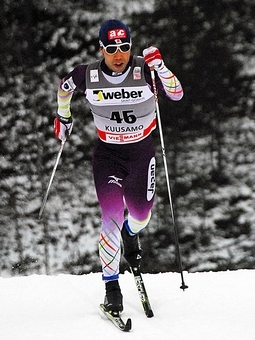 Yuichi Onda, cross-country skier and member of the Arc Communications Ski Team, participates with unflinching resolution in such races taking place at the heart of cross-country skiing competitions. Onda is a sprinter, which means he is best at running short distances, and one of the medal hopefuls for the 2014 Sochi Winter Olympics. With his mind set on making it onto the podium, he is now fully committed to his career as a competitive skier. In this interview hosted by Arc Communications representative Mariko Ohsato, Yuichi Onda talks about many things, including his strong feelings toward cross-country skiing and how he spends his time off-season. Ohsato: So Mr. Onda, out of the many types of cross-country skiing races, you excel at sprints. I’ve heard that sprint running is a very tough sport which requires stamina as well as instantaneous force. What kind of circumstances do you compete under in these races? Onda: The usual length of a sprint race is approximately 1,500m. After the preliminary race, the number of competitors is narrowed down to the 30 skiers who completed the track in the shortest amount of time. You can only proceed to the final tournament if you’re in the top 30. Then, the skiers compete in groups of six, where only the top two skiers of each group along with the two fastest runner-ups can continue to the next stage. In doing so, and considering there isn’t much time between races, as soon as a race is over you have to go to the next starting block. Depending on the place, it can take up to about 5 minutes from the finish line to the starting point. Ohsato: One sprint race takes 3 to 4 minutes, so does that mean you have to ski at full speed for 3 minutes and then get back to the starting blocks in 5 minutes? That sounds like hard work! Onda: Not exactly, because the next race doesn’t start immediately after you get back (laughs). But the interval time becomes shorter and shorter as you rise to higher professional levels. It is exhausting. Ohsato: Besides, unlike swimming or other athletic sports, all the races from preliminary to final are conducted in the same day, aren’t they? Onda: Right. The whole competition lasts 3 to 4 hours, and your 3 or 4 races –from the preliminary to the finals– are all over within that time frame. Your capacity to recover between races as well as the amount of strength and energy you can save for the very last part of the finals really are crucial points in this sport. Ohsato: So it really does require stamina. Is it true that there also is a combative element to it? Onda: Yes, cross-country skiers often collide during races, so it can be considered a combative and dangerous sport at times. And thinking of tactics to overthrow your opponents is an important factor too. Moreover, cross-country ski is a team sport. Well-built Norwegian or Swedish skiers sometimes loom in front of their opponents to let their teammates win, and at times there are skiers whose duty is to put pressure on their adversaries. Ohsato: But you’re often alone in the final round. Doesn’t competing against team skiers put you at a disadvantage? Onda: In any case, it can’t be helped. But winning under such circumstances is deeply satisfying! Ohsato: I saw you skiing at the Asian Winter Games in Kazakhstan, when you arrived at the stadium to cross the finish line. I do wish I could have actually seen you fiercely competing before making your way back to the stadium (laughs). Ohsato: More than most sports, cross-country skiing depends a great deal on equipment, doesn’t it? It’s an individual sport, yet the skiers are assisted by mechanics just like in Formula 1. It’s a team sport in that sense too. Onda: Exactly. The weather and the quality of the snow changes every day. The mechanics’ job is to find the ideal wax for that day’s weather and snow, or what you might call the “Holy Grail of waxes”. They choose the best wax out of hundreds or maybe thousands of different types, things we skiers are absolutely clueless about. Ohsato: What do you mean by “finding the Holy Grail of waxes”? Onda: As you know, unlike Alpine skiing; cross-country skiing courses have both hills and slopes. You wax the center of the skis to prevent them from sliding backwards when you are trying to go up a hill. If the wax isn’t appropriate for the snow quality, you slide down whilst climbing. Also, you have to wax the rest of the skis with another type of wax for skiing downhill: if this isn’t done properly, you cannot gain speed. Ohsato: Sometimes, even we amateurs can tell whether a player’s skis are gliding well or not. For each country, finding the ideal wax for the weather and snow conditions is also part of the competition. Onda: Yes. Often there are situations where one country is gliding well while another isn’t. Ohsato: Is there any chance of winning with the wrong type of wax? Onda: Actually, the mechanics have about 20 pairs of skis waxed for you. But you’re the one who actually chooses which one to use. Skis can have different degrees of stiffness: if you wear flexible skis on soft snow, they may get stuck and slow you down. Although each country may select its preferred type of wax, you’re the one who chooses the skis, so I would say it’s an individual battle after all. Ohsato: If each skier has more than 10 pairs of skis, that must mean there are quite a number of skis per team. Onda: Some skiers bring up to 20 pairs or so, even though in the end they only use one of them. The Japanese team doesn’t have enough mechanics so the coaches and everyone –except for the skiers– help wax the skis for us. Ohsato: In other words, countries where cross-country skiing is popular and have many staff members and a strong budget are at an advantage. Onda: The Japanese team has 3 members on waxing duty for 6 skiers, whereas some top countries have over 30 mechanics. Ohsato: So Japanese skiers are faced with pretty adverse circumstances then. Onda: No, I don’t consider them adverse. Once you’re at the starting point, you only have results in mind anyway. Ohsato: I heard that you have quite a terrifying aura before the games. Some skiers seem to try to boost their concentration by listening to music, etc. Do you have a concentration technique of your own? Onda: Not really. I merely move around, and moderately at that. But I always put pressure on myself. Once you’re at the starting line, you have to forget everything else and only focus on doing your very best. I lose sight of people before games, though. I have to keep moving constantly to keep warm and I’m busy preparing, so I apparently pretty much stop talking. I have been told that I’m scary, unapproachable (laughs). Ohsato: Your natural capacity to keep a high level of concentration might be your strong point. You aren’t scary at all when you’re at Arc (laughs). Ohsato: How do you train during the off-season? Ohsato: Yes, we trust that you’re practicing stoically (laughs). That’s all the more reason for us to be looking forward to your coming to Tokyo and stopping by at Arc. Onda: When I come to Arc, well, you know, I’m pretty nervous. I feel so bad because company members even stop their work to listen to me. Having lunch together and talking to them when they visited me in Myoko in winter was a lot of fun. I’m very happy and grateful for your support, it means a lot. 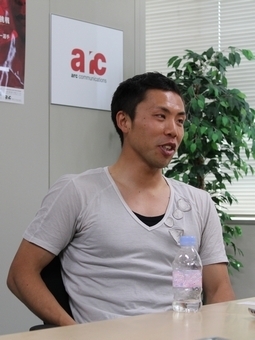 Ohsato: Cross-country skiing must be, in a way, a battle with solitude; just like marathon or ekiden, you fight alone. Are you usually alone in your summertime practices too? Onda: Yes. From spring to autumn in my hometown, I use roller skis to ski on places similar to mountains, like the asphalt farm roads for example. I also train using machines of course, and I go running long distance. Ohsato: A surprising number of players are unable to practice in their hometowns, so I guess you’re lucky to be able to practice in Myoko. What are the appealing aspects of practicing in your homeland? Ohsato: Wow, what do you do with the bamboo sprouts you get when you’re practicing? Onda: I run holding them (laughs). But really, I’m happy. I’m grateful that people watch over me and support me warmly. I’d like to do my best to respond to their feelings and live up to their expectations. Ohsato: Reading your blog, I noticed that you participate quite a lot in mountain bike races too. What is mountain biking to you? Onda: I feel that mountain biking is the perfect sport to train for cross-country skiing. The courses are a series of hills and slopes similar to ski courses, and a strong body trunk is essential to control the bike. You can improve your sense of balance too. What’s more, I can be the challenger when it comes to this sport, which is very exciting. I run during my training, but to tell the truth I’m not very fond of marathons and such because you have to keep running all along. Biking, like skiing, has times when you don’t have to pedal (laughs). Ohsato: You hardly spend any time in Japan during winter because you compete in Europe. Where in Europe does your training camp usually take place? Onda: I mainly train in Vuokatti, located in the center of northern Finland, which is famous for its sports training center. My favorite country is Norway, though. The people there support skiers regardless of the country they are from. That’s what I like about Norway. Ohsato: I’ve been to Finland too, for an international competition. I felt that there was an evident difference between skiing for fun and skiing professionally. You have to corner yourself. Onda: Yes, in my case I deliberately put myself in such extreme conditions. After the competition season is over though, I go skiing on hills and mountains for fun and give skiing lessons to children too. Always being in “competitive mode” and keeping the batteries running full-time can be exhausting. I mean, cross-country skiing is actually fun. With the fresh air and beautiful snow, it’s very wholesome. It’s wonderful for the body as long as you ski for fun. Ohsato: I went to the 2011 Asian Winter Games in Kazakhstan and saw your Sprint race in person. You won the bronze medal that time, but I so wish you had won gold! It was so frustrating! Still, I was greatly moved by your strenuous efforts. We’re all looking forward to the Sochi 2014 Olympic Games. Onda: Yes, that’s what all the tough practices are for. And Ms. Ohsato, you must go to the Sochi Olympics too. I hope you can see me doing my best while aiming for the top spot. I promise I’ll achieve wonderful results. Yuichi Onda is as well-built as the strong European skiers. Though he gives an impression of unmatched daring, he is a sensitive and caring person too. He is undoubtedly one of the leading cross-country skiers in Japan and has his mind set on winning a medal for sprint in the 2013 Val di Fiemme Nordic Ski Championships and in the 2014 Sochi Winter Olympics. Please keep up the warm support for Yuichi Onda, a charming world-class top athlete. Would you be interested in joining the “Arc Communications Ski Team Fan Club” and supporting Yuichi Onda? We are planning fan events such as send-off parties and others during the off-season where fans can talk personally with him. Let’s pursue the Olympic dream with Yuichi Onda!